UC Capitals re-sign Maddison Rocci for the 2019/20 WNBL season. Photo: Supplied by UC Capitals. Maddison Rocci’s heart was always telling her to come back to Canberra. Thankfully for the UC Caps, the rising star listened. 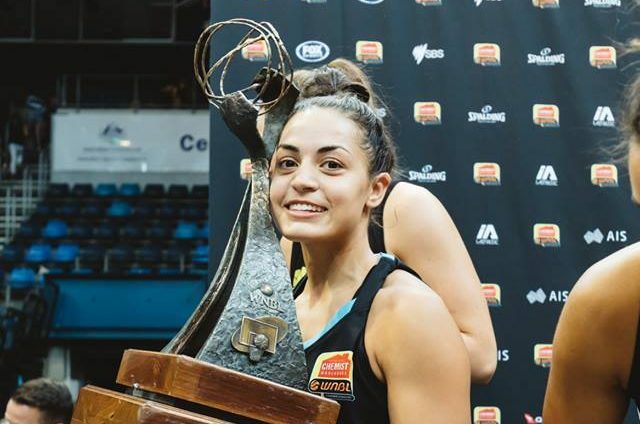 The 20-year-old guard re-signed with the University of Canberra Capitals for a third consecutive season ahead of WNBL 2019/2020 after coming off contract after the championship success last season. Rocci had an impressive season with the championship team, claiming the Capital on The Rise award at the UC Capitals presentation which recognises the most promising young talent. “I have loved my past two seasons with the UC Caps and I’m so excited for the upcoming season,” Rocci said. “I can’t wait to be able to play in front of our fans again and give back to them in any way I can. Rocci was a prominent figure coming off the bench for the Caps during the 2018/19 season, with her stats going from strength to strength from the previous year. Coming off the back of a great personal season, Rocci said she doesn’t have any expectations other than to have another successful season with the team. “I am going to continue to work hard and make sure I’m ready to compete the best I can to help the team achieve our major goal,” she said. Head coach Paul Goriss lauded her improvement last year and was excited to see the young guard put pen to paper. “Maddy provided a spark off the bench in the finals series but also her starting minutes and her role she played early on in the season when Lei was coming back from injury cemented her as one of the elite guards in the WNBL,” he said. “Just having that younger guard that can pressure the ball up the floor and play with speed and just her defensive presence was really key for us. Goriss believes Rocci is capable of becoming a WNBL starter if the club does not re-sign Kelly Wilson or Leilani Mitchell.